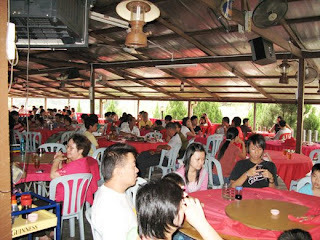 My colleagues invited me to join them for a seafood lunch at Ulu Langat last Sunday. Met them in front of the office at 1pm before heading to the place. Reached Ulu Langat at about 2.30pm only to find it PACKED with people. Since we had to wait for about 1 HOUR (I kid you not!) 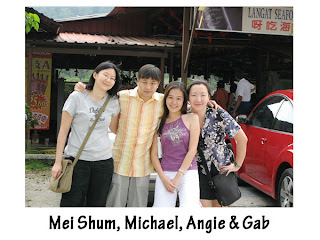 for a table, I walked around with Mei Shum, Micheal and Angie. Once seated, we had to wait for another one hour for the lady boss to take our orders. Apparently they were severely short-staffed so we had to help ourselves to the drinks we wanted…BEER. 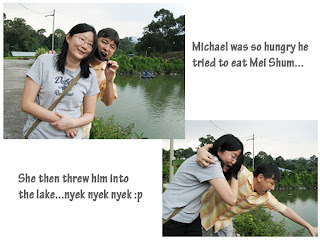 We were so hungry till can die wei…at least I was la (didn’t have anything to eat the whole day)…I nearly ate Mei Shum. :p “Lunch” was finally served at close to 4.45pm. By that time, I had already chugged down 4 glasses of beer. 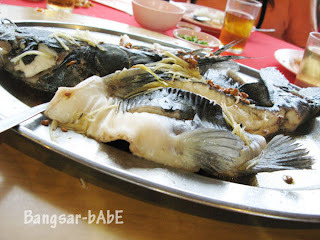 The tilapia, deep-fried till golden brown and crispy was quite delicious. Topped with sweet & sour gravy with chunks of bell pepper, pineapples and quartered onions, it went well with steamed white rice. 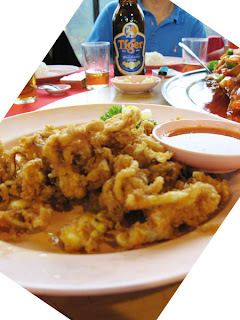 The squid, although not bad failed to outshine the fish. I found it slightly on the soggy and oily side. I like my squid to be crispy and not dripping with oil. 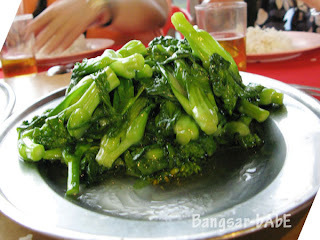 I thought the kai lan was mediocre as it lacked garlic and was too oily. 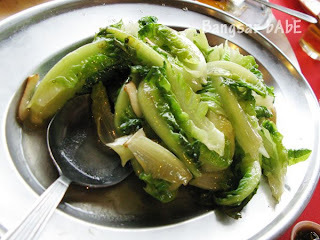 The prawns were unbelievably fresh and bouncy…I like! 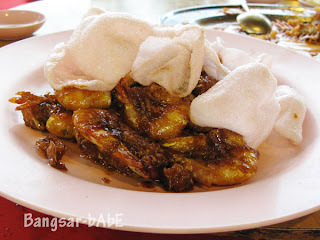 Fried and coated with sticky plum sauce that enhanced it’s natural sweetness and succulency, I relished every morsel of it. 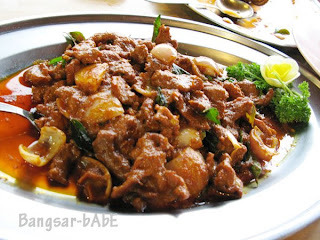 I loved the wild boar curry the most; tender slices of wild boar and quartered onions cooked with fragrant curry spices. 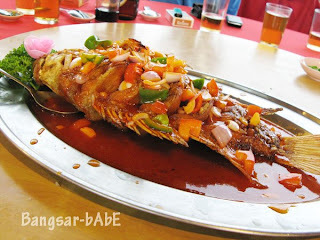 Not only was it rich in aroma, it was full of robust flavour with a tease of santan. I shamelessly helped myself to more. The catfish wasn’t quite to my liking. I thought it lacked ginger and it had that “muddy” smell and taste. 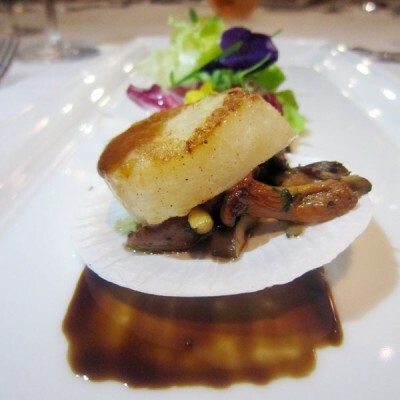 The yau mak was standard…and good palate cleanser after the gratifying wild boar curry. 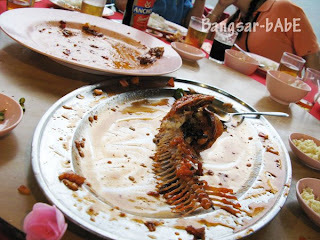 The meal ended around 6pm….the longest lunch I’ve had so far. 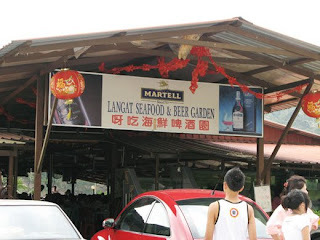 The bill came up to RM 35 per person including 10 bottles of beer…or maybe more. Not sure how much each dish cost…but it should be pretty reasonable. Verdict: Quite a nice place to have group meals. The wild boar curry, prawns and sweet & sour tilapia are worth trying. Been to this place once for dinner. Very nice environment but luckily, it was not full that night. I didn’t know it is so packed during lunch. My colleagues went there a few times before and told me it has never been this packed. 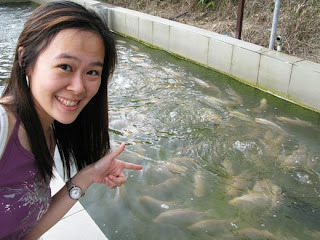 Maybe because we went on “cheng beng” day..